Aarsun Woods presents you this Beautifully handcrafted by skilled artisans from premium quality Teak Wood and dual polished. 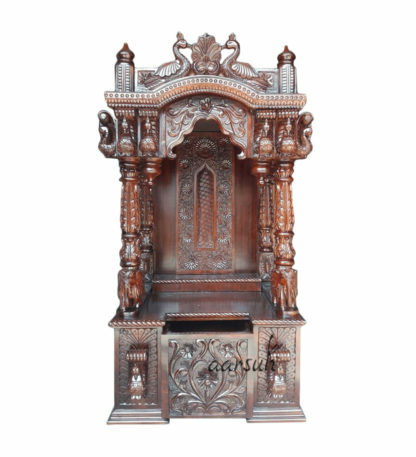 Wooden Temples instills a sense of faith and peace to our homes. A large number of made to order designs available. The Center , also known as Garbgriha, consists of 2 pillars attached to the back and two pillars in front of the temple. The pillars in front consists of Peacocks in front and sides at the top. The base of the front pillar consists of elephants carved out by skilled artisans. The back of the Garbgriha consists of floral design. The ceiling consists of Lighting Provision inside the Wooden Temple. 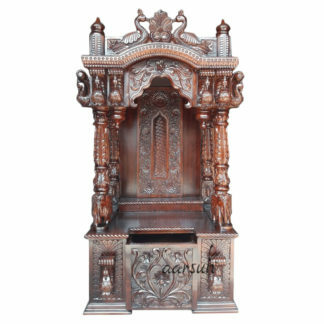 The base of the Wooden Temple / Mandir consists of a single pull out Drawer with Beautiful Carving in Front and Peacocks Carved out at the adjacent.